WASECA - Grants totaling $73,166 were awarded Wednesday to schools, cities and organizations in Waseca County. As it does in the spring each year, the Waseca Area Foundation Board of Directors makes presentations to recipients chosen by its grants committee, which is chaired by Dr. Wes Rethwill. This year, 33 applications requesting $90,000 were received by the WAF. With only about 30 percent of that amount available for grants, not every request could be fulfilled, said WAF board chair Gyles Randall. Teaming with Paul and Sue Rosenau and their Legacy of Angels Foundation made it possible to fulfill more requests and give more money, said Randall. Grants totaling $26,698 were presented by Randall and Rethwill to 21 recipients, with awards ranging from $250 to $3,796. Thanks to the funds, improvements will be made at the Waseca Arena; Red Cross CPR training will be affordable; flowers will again beautify downtown Waseca; the regional library and Sleigh & Cutter Festival receive support; residents at the New Richland Care Center will get a whirlpool tub; and Waseca's historic neighborhoods will be surveyed. In the schools, students at TEAM Academy will visit the Minnesota Science Museum; curriculum is funded at School Age Care; youth in grades 4-9 can participate in summer theater; junior high kids will have the materials to complete a painting project; and this summer's Tot Lot kids will listen to music on updated equipment. At Hartley, students will have access to accelerated math and zoo and science programs; CIS students will have a Tier 1 reading program and a ceramic tile project; and at the high school, business and math departments, the freshmen LINK program, and character education all received funding, in addition to the purchase of one Apple I-Pad. Deb Hoelmer, media director at Hartley Elementary School, who accepted the grant for Minnesota Zoo & Science Programs, said the funds help with student enrichment programs they might not otherwise have. "The students are learning what it means to give back," she said. "They understand that the community supports them as students. That has come from the Waseca Area Foundation." From the Rosenau Legacy of Angels, grants totaling $46,468 are making it possible for county Veterans Services to replace its aging van used to transport patients to the VA Hospital; for the junior high to continue its Community Read Program and for Hartley to continue its Artist in Residence Program. The Janesville Library, a 101-year-old building in need of repair, received funds that will pay for estimates to get a repair project going, according to Janesville Mayor Mark Novak. From the Legacy of Angels, three $10,000 grants were presented by Paul and Sue Rosenau to the Sleigh & Cutter Festival, the Dream Catchers Program and Infants Remembered in Silence. Ken Borgmann got emotional as he accepted the S&C and Dream Catchers grants. "There are moments such as today when we experience true wonder and awe," he said. Borgmann said he hopes to put the grants into permanent funds for both the festival and the Dream Catcher Foundation for terminally ill children. Sue Rosenau spoke of her granddaughter Makayla's Make A Wish trip to Disney World before her death that gave the family important and lasting memories. Diana Sundwall, founder of Infants Remembered In Silence, and its board of directors, accepted a $10,000 check from the Rosenaus. Until the grant was announced, Sundwall did not know the amount IRIS would receive. "This will make a huge difference in the work we do directly with families," she said about the grant. The Faribault non-profit organization is dedicated to providing support, education and resources to parents and families who have lost a child in early pregnancy or any form of infant or early childhood death. "It's incredible," Sundwall said about the grant. Because Paul and Sue Rosenau lost their own granddaughter at age two, "they totally understand," she said. The WAF grants came from the following unrestricted funds: Waseca Area Foundation Endowment Fund, James B. Corchran Memorial Fund, W.H. and Estelle Rethwill Fund, Bud Schmidt Trucking Company Fund, Waseca High School Class of 1970 Fund, Jane and John King Family Fund, The Rutledge Family Fund, Dr. Robert M. and Helen C. Collins Fund, Dr. O.J. and Betty Swenson Fund, Wes and Carol Rethwill Fund, Curt and Nita Sjoberg Education Fund, Roy and Jeanette Tollefson Fund and Neil and Sharon Fruechte Fund, plus the Gedosch-Fell Memorial Fund. Flowers in the downtown business area were funded by the City of Waseca Beautification Fund, and grants to the Waseca High School LINK Program and Character Ed Program were funded by the Barb Penny Youth Fund. 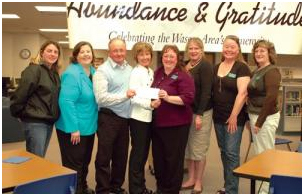 A $7,864 Waseca Schools Tech Support grant came from the Rosenau Waseca Schools Technology Fund. The Herb Streitz Memorial Band Fund also received a grant for $4,000 which went to Waseca Band Boosters for band expenses, according to WAF Executive Director Karen Buum.